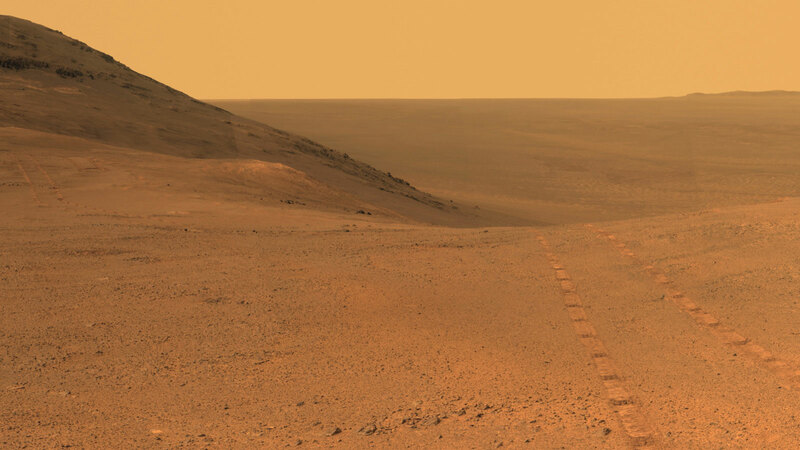 Opportunity’s panoramic camera (Pancam) took the component images for this view from a position outside Endeavor Crater during the span of June 7 to June 19, 2017. Toward the right side of this scene is a broad notch in the crest of the western rim of crater. Credits: NASA/JPL-Caltech/Cornell/Arizona State Univ. One month since increasing their commanding frequency, engineers have yet to hear from NASA’s Opportunity rover. Scientists reviewing data from the Mars Color Imager (MARCI) aboard NASA’s Mars Reconnaissance Orbiter (MRO) have determined that the tau estimate (a measure of the amount of haze in the Martian atmosphere) in the skies above the rover Opportunity has been below 1.5 for two consecutive measurements. With more sunlight reaching the rover’s solar array, the Opportunity team at NASA’s Jet Propulsion Laboratory in Pasadena, California, are increasing the frequency of commands it beams to the 14-plus-year-old rover via the dishes of NASA’s Deep Space Network from three times a week to multiple times per day. Passive listening for Opportunity will also continue to be performed by JPL’s Radio Science Group, which records radio signals emanating from Mars with a very sensitive broadband receiver. The additional several months for passive listening are an allowance for the possibility that a Red Planet dust devil could come along and literally dust off Opportunity’s solar arrays. Such “cleaning events” were first discovered by Mars rover teams in 2004 when, on several occasions, battery power levels aboard both Spirit and Opportunity increased by several percent during a single Martian night, when the logical expectation was that they would continue to decrease. These cleaning dust devils have even been imaged by both rovers on the surface and spacecraft in orbit (see https://www.youtube.com/watch?v=k8lfJ0c7WQ8and https://mars.nasa.gov/resources/5307/the-serpent-dust-devil-of-mars/). Be the first to comment on "Latest Update on Opportunity Rover after Martian Dust Storm"